The Finishing Touch: Your Next Project is Online! We are thrilled to now offer you the option of buying your next project from the comfort of your own home. Check out our online shop here. Every week a new design will be featured. You will have the option of buying the graph OR the graph packaged with a specialty fabric….SO, be sure to bookmark our site and check in weekly. 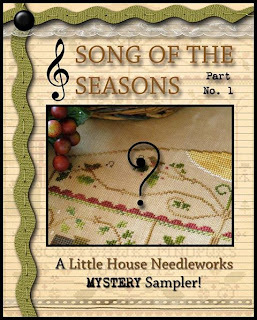 The Little House Needleworks Mystery Sampler, Part 1, arrived today, complete with Weeks Dye Works fibers and hand-dyed Straw linen. If you did not get your order in, we have all you need to begin this 3-part project. Can’t wait to see the complete sampler. Blackbird Designs is ready to begin another exciting year of Loose Feathers. There will be 12 designs in this series. Beginning in July, one design will be released each month. Barb and Alma have created designs inspired by love of family. 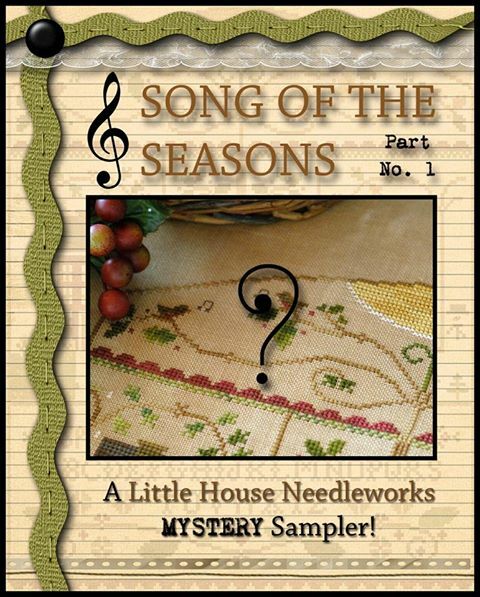 Size of the first sampler is 6x6, but sizes will vary. Designs are stitched on 30 ct. R&amp;R linen, using Gentle Art, Crescent Colours and Weeks Dye Works fibers. We have a sign up list if you would like to receive the Loose Feathers Series.